The Cavotec engineering group is working closely with a number of mining groups, port authorities and others to optimize the efficiency with which bulk materials are shipped, handled and stored — from extraction to final destination — by expanding the use of automation and electrification. This article, by the Cavotec engineering group’s Yann Duclot, provides an overview of how Cavotec is working with mining groups, port authorities and others to maximize efficiency and improve safety. Duclot is Cavotec’s Group Manager, Sales & Marketing. Cavotec manufactures a comprehensive range of automation and power control and distribution technologies that help minimize operating costs, improve safety standards and reduce environmental impact. group’s unique MoorMasterTM automated mooring technology. 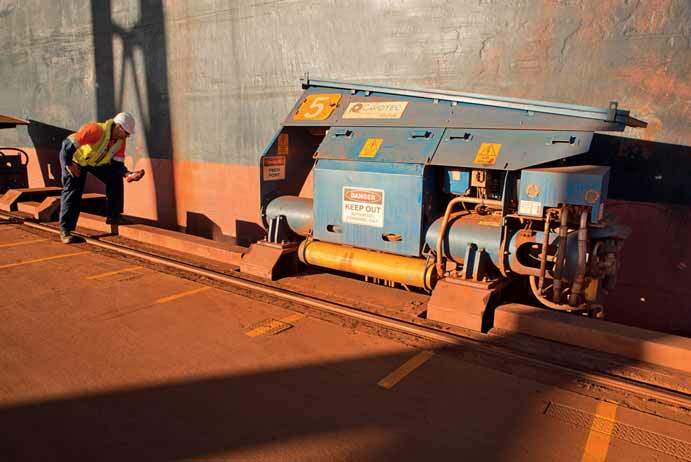 Increasingly, Cavotec’s Alternative Maritime Power (AMP) systems are being introduced at bulk handling applications, as operators take steps to meet regulatory demands to reduce emissions from ships in port. Cavotec technologies are used at a variety of bulk applications worldwide to handle, store and ship bulk product including iron ore, coal, potash, grain, petroleum and gravel. Cavotec customers in the bulk sector include major mining and other bulk handling groups, port authorities, equipment manufacturers, as well as construction and engineering groups and shipping lines. The group works closely with organizations such as Sandvik Mining,ThyssenKrupp,Tenova Takraf, Caterpillar, FMC, BHP Billiton, FMG Fortescue, Rio Tinto, LKAB,Vale and Port Hedland Port Authority in Australia. Cavotec has a number of competitors in the bulk segment. To maintain and grow its position, Cavotec works closely with customers, and the wider industry, to listen to challenges faced by operators, and develop innovative solutions to these issues, often on a case-by-case basis. Cavotec develops solutions that minimize process delays and prevent uncontrolled events that could impact operator safety. It seeks to continuously increase its expertise and share this with clients. Cavotec has consistently invested in new, innovative technologies to ensure customers maintain their competitive edge. Examples of such systems are MoorMasterTM and AMP. These long-term investments are typical of Cavotec and something the group continues to remain alert to. Cavotec is currently working on a major bulk handling project involving the supply of 18 specially designed MoorMasterTM automated mooring units on behalf of the PEAB construction and civil engineering group. The units are being installed at the LKAB mining group’s new iron ore berth in Narvik, northern Norway. The project includes manufacture, installation and comprehensive technical support. The units will moor bulk carrier ships of up to 185,000dwt and 305m. This is the first MoorMasterTM bulk handling application in Europe, and the first located within the Arctic Circle. As such, the MoorMasterTM units for this project are built to withstand the harsh winters and demanding operational conditions of the location. Cavotec is further developing its range of HOI systems. The Group’s HOI products integrate with its RRC systems with portable screen solutions, video links, control chairs and joysticks that support remote-controlled and semi-autonomous operations. The new range of products and associated services are targeted at three distinct sectors — mining and tunnelling, oil and gas and general industry (mobile cranes, drilling, forestry) — and are divided into two primary offerings: retrofitting existing equipment, and integration into new-build manufacturing applications. The first of these two offerings tends to be tailored for individual customers, while the latter is often more attractive for OEMs. Both are areas where the group sees substantial potential for future growth. For retrofit projects, Cavotec offers comprehensive turnkey HOI solutions, where the group provides installation, commissioning and training through its extensive in-house competence, and in collaboration with partners all around the world. The range includes both explosion-proof and standard units. The group is also in the process of delivering a fully integrated AMP-MoorMasterTM system — a unique engineering achievement — for use with the world’s first battery powered passenger ferry.